Pattern: Check Product Line: Louis Vuitton Neverfull. Neverfull large size MM. Material :Damier. Width (cm) : 32 cm(approx). Height (cm) : 29 cm(approx). Depth (cm) : 17 cm(approx). Handle (cm) : 51 cm. (Inside Flaws) ink stains in the pocket. Zipper works properly. We apologize for inconvenience. Pocket(inside) Pocket(outside) However, it is difficult to show every angle of each item. dirt, creases,scratches, stains,discoloration,worn,scuff. Outside condition Size in cm (approx.). :W 33 x H 16 x D 2.5 Strap Drop 51. Louis Vuitton Neverfull MM Damier Azur . Shipped with USPS Priority Mail. Condition is Pre-owned. shown in pictures. Authentic Louis Vuitton Neverfull MM handbag/tote with Pouch. Color:Pink Interiior - Rose Ballerine. The interior is Rose Ballerine. Material: Canvas. Louis Vuitton Damier Azur Neverfull GM. Condition is Pre-owned. Shipped with USPS Priority Mail with insurance. Louis Vuitton. It is lined in cherry red Alcantera with a long zipper pocket inside dividing the bag into two sections. Includes detachable shoulder strap, lock, one key, and dust bag. Date Code: SD1025. This Louis Vuitton Saleya Handbag Damier PM, crafted from damier azur coated canvas, features dual rolled vachetta leather tall handles, structured base and gold-tone hardware. Its zip closure opens to a beige microfiber interior with slip pockets. Like New Condition! Incredible Condition! -Leather trim. 100 % Authenric ! -Made In ITALY. -Internal double flat pocket. 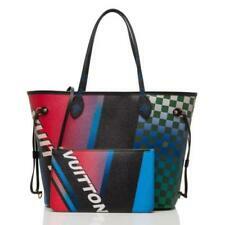 This is the "Beaubourg" tote bag by Louis Vuitton. It has an open top design and features an exterior side snap detail. 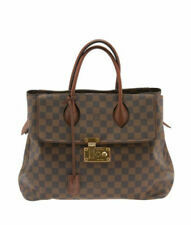 This Louis Vuitton bag is composed of Damier Ebene leather coated canvas and is lined in chocolate brown cotton fabric. This Louis Vuitton Saleya Handbag Damier PM, crafted in damier azur coated canvas, features dual rolled leather handles, leather trim, and gold-tone hardware. Its top zip closure opens to a beige microfiber interior with slip pockets. Its top zip closure opens to an orange fabric interior with a zip pocket. Authenticity code reads: TH0023. Model: Chelsea Handbag Damier. Designer: Louis Vuitton. Item Number: 40605/1. The Damier Ebene canvas really is stunning ! dark brown leather details and adjustable handles. Color: Brown. interior is spacious with a red alcantara lining, an open pocket, a cellphone pocket, a zip pocket, and a hook closure. 100% Authentic Louis Vuitton Jersey Damier Handbag N44041. Damier Ebene coated canvas & Taurillon leather exterior. Smooth cowhide leather & Taurillon leather trim. Everything you see in the photos is accurate. Measurements Length: 14 in Height: 13 in Width: 3.75 in Drop: 5 in Adjustable Drop: 15 in Bag is in Brand New Condition Smoke free home 100% authentic Come with dust bag Signature is required upon delivery Date Code: DR3146 please review all the pictures as part of my description Please if you're not familiar with Louis Vuitton you can send my photos to a professional authenticator of your choice before purchasing! please feel free to ask any questions before purchasing! Gorgeous authentic Louis Vuitton Damier Ebene Venice tote (N51145). Top zip, inner zip pocket, brown Alcantara microsuede lining, dual handles. Pristine condition, very minor signs of wear to exterior - see photos. Auth Louis Vuitton Hampstead MM Damier Ebene Purse, Shoulder Bag, Tote. Condition is Pre-owned. Shipped with USPS Priority Mail. Light Imperfections to be expected with being worn. Documented in photos. Stunning and hard to find. Is the ultimate Louis Vuitton icon. The original and complete city bag, it is the stylish. In Monogram canvas, the Speedy 30 is elegant. PRICE IS FIRM. 30 x 21 x 17 cm ( length x height x width ). 100% AUTHENTICITY or Your Money Back. Louis Vuitton Neverfull Mm Damier Ebene Tote. Condition is Pre-owned. Shipped with USPS Priority Mail. This is a very stylish tote that is beautifully crafted of Louis Vuitton damier canvas leather in small size.The bag features chocolate brown cowhide rolled leather handles. trim ,detachable shoulder strap which is like NEW condition. Louis Vuitton Damier ebene hampstead PM handbag tote bag - Mint Condition! AUTHENTIC LOUIS VUITTON NEVERFULL BAG MM. This Louis Vuitton Neverfull Tote Damier MM, crafted in damier ebene coated canvas, features dual slim handles, side laces, and gold-tone hardware. Its wide open top showcases a red fabric interior with a side zip pocket. This MM is the mid-size of the LV Neverfull family. Series: Neverfull MM. Material: Damier Azur. Designer: Louis Vuitton. Style: Tote. Accessories: Dust Bag and Box. Inside: Dirt marks, signs of use. This Louis Vuitton Neverfull Tote Damier MM, crafted in damier ebene coated canvas, features dual slim handles, side laces, and gold-tone hardware. Its wide open top showcases a red fabric interior with side zip pocket. Handle Drop 12 in. Height 11.2 in. Louis Vuitton Damier Ebene Canvas Manosque Damier GM Tote Bag, Made in France. Bag size 13"L x 5.75"W x 11"H.
Limited Edition Louis Vuitton LV Cabas PM Damier Azur tote in good condition, with wear on the leather and lining. 100% Authentic. Made in France. The wide top is open to a pink striped interior with a zippered pocket. Year: 2018. Accessories: Box and dust bag. Gently Used. Details & Care. 100% authentic . Date code TH0065. In very good used condition, comes with dust bag, lock and key , no major flaws/rips/ stains. Minor signs of wear on handles . This Louis Vuitton Tadao Handbag Damier Infini Leather MM, crafted from yellow damier infini leather, features dual flat leather handles, leather trim and matte silver-tone hardware. Its zip closure opens to a brown fabric interior with slip pockets. Pattern : Damier Ebene. Style: Tote. Interior Lining : Suede. Material: Canvas. Each year counterfeiters work hard to perfect their knock-offs. Who wants to wait months on end watching and waiting to receive a check?. This Louis Vuitton Greenwich Tote Damier Cobalt, crafted in damier cobalt coated canvas, features dual rolled leather handles, black leather trim, exterior zip pocket, and silver-tone hardware. Its zip closure opens to a navy microfiber interior with side zip and slip pockets. Material :Azur. Width (cm) : 32 cm(approx). Height (cm) : 29 cm(approx). Depth (cm) : 16 cm(approx). Handle (cm) : 49 cm. Color : White. minor stains on the top of the handle. GOOD CONDITION. Material :Azur. Width (cm) : 32 cm(approx). Height (cm) : 29 cm(approx). Depth (cm) : 16 cm(approx). Handle (cm) : 49 cm. storage odor in the lining parts. Color : White. GOOD- CONDITION. Shoulder strap drop: 6.5". OVERALL GOOD CONDITION. Signs of Wear: Exterior shows minor scratches on leather trim and handles. Interior pocket shows few minor pen marks and wear. In excellent condition. From a smoke free home. exterior: one minor wear spot on strap under flap (can see in image) interior: one ink spill / stain. Can see in image overall - in Great condition. The perfect gift! I will do bulk shipping if purchasing more than 1 item. Please let me know if you have any questions. ❤️Auth Louis Vuitton Neverfull MM Damier Azur Limited Edition TAHITIENNE Tote with dust bag ❤️. 100% Authentic Louis Vuitton Kensington Damier Ebene Canvas. Condition is Pre-owned. Includes dust bag. Material :Azur. Width (cm) : 32 cm(approx). Height (cm) : 29 cm(approx). Depth (cm) : 16 cm(approx). Handle (cm) : 49 cm. Color : White. GOOD CONDITION. (Outside Flaws) stains on the leather parts. Authentic Louis Vuitton Girolata Damier Azur Canvas Tote Bucket w/receipt. 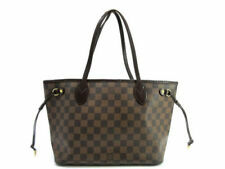 • LOUIS VUITTON Girolata Damier Azur Canvas bag, style N41579 -Made in Spain. • Dual rolled top handles with removable shoulder strap marked LOUIS VUITTON.